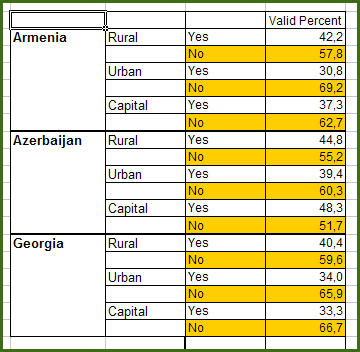 According to CRRC’s dataset, about 25% of the adult population in Armenia and Georgia, and 20% of Azerbaijan’s citizens say they are unemployed. Further analyzing these numbers shows that 18% in Georgia, 14% in Armenia and 12% in Azerbaijan are actually interested in looking for a job. Yet the data shows sizeable differences across the countries, depending on whether you ask in rural areas, urban environments, or the capital. Let's look at what people say when asked whether they consider themselves to be employed. Note that housewives, pensioners, disabled and students are also considered "not employed". Do you consider yourself to be employed? This employment may be part-time or full-time, you may be officially employed, informally employed, or self-employed, but it brings you monetary income. If you analyze the data of by settlement type, it reveals that of those that describe themselves as not employed a relatively low number of people look for work in Baku (22%), compared with Tbilisi (29%) and Yerevan (32%). Besides, about the same share of people (again, of those describing themselves as not employed with monetary income) in the three countries look for a job in rural areas (nearly 30%). However, the data impressively illustrates that the major interest -- among those that are not employed -- in a workplace can be found in urban areas, where about 40% of Armenians and Georgians, and almost 50% Azerbaijanis try to find work. This figure powerfully underlines the desolation of Caucasian cityscapes. Of those that are not employed, what percentage is looking for a job? Finally, the DI statistics show that the same number (once you factor in the margin of error) of people is unemployed and interested in a job, but not currently looking: 6% in Armenia, and 5% in Georgia and Azerbaijan. A slightly lower number of the unemployed is not looking for a job at all. Have those already given up? Now the definitions of unemployment always are a little complicated (are pensioners looking for work considered unemployed? ), but here is an article that can help. If you are interested to check the datasets yourself , please download it from CRRC’s homepage. For more information on the Data Initiative project, please click here.